I went to the post office to mail a package. I was expecting to wait in line, and I knew going into that building that the inevitable 20-minute wait would feel like four hours. In my experience, the post office was like purgatory. Everyone hung around sighing and swearing under their breath, hoping that their stint in the pseudo hell line would end shortly and they could go to a better place. Part of the problem with the post office was that it offered no distraction. The walls were painted white, and the only entertainment was the “Most Wanted” List that was stapled to a bulletin board that was secured behind a glass display case. I will admit that I did enjoy perusing that list to make sure no one I knew had cracked that prestigious top 10, but alas, my family and friends either led honest lives or flew silently under the FBI radar. I don’t know for sure what I would do if I recognized someone, but my guess is that if there was a reward, I would be singing like a canary to the Feds. However, this post office trip was different. As I walked into the post office this time, a new feeling emerged. In fact, I did not recognize the place. Gone was the boring atmosphere; I was surrounded by brightly colored boxes and wrappings and gifts and cards. It was no longer a dull place but a happy place, and I was so shocked by the happy place that I walked outside and read the sign on the front of the building in case I missed that the post office had been taken over by a Hallmark store. But it still was the post office–very official on the outside but inside there was enough pink to make Barbie proud. I still had to wait in line for the one and only window that was open, but the wait did not make me wish that I had brought with me a noose to hang myself. No, instead, I shopped. I bought Father’s Day cards, a get well card for a friend, a cute little stuffed animal that went with the get well card and a few of the decorated boxes which eliminate the hassle of wrapping paper. So instead of the $2.41 it would have cost me to mail my package, I spent $35. 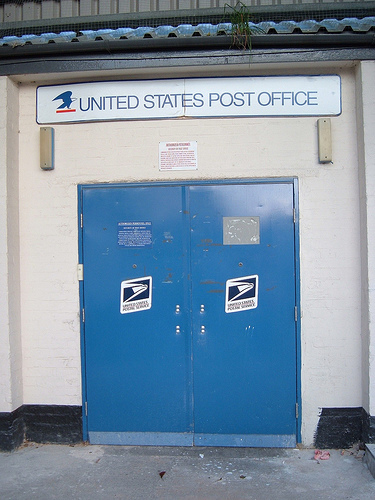 Many people think the post office way of thinking is outdated, but I must disagree. Of the four customer service windows, only one was open to serve the 20 people in line and on either side of that line there were new cards to read, stuffed animals to touch and civil war stamp kits to pass the time. Outdated? NO WAY. I say the post office has mastered the art of the captive audience. And if they get a few more patrons like me in their line, I think their financial troubles might be over. I hate to admit it but I kinda like going to the post office. This sounds like a very good time to buy your own postage scale, buy all of your stamps and things online, and wear a set of blinders when you have to stop by the PO for JUST A MINUTE to shove a package into a mail slot. good thinking! It will save a lot of money! The post office should employ Don Don’s to hang out in the audience, looking non-gum and whatnot! I could do that Bill! I would be the perfect shopper attractor! Really a clever way way to help reduce their bloated budget. Between this and taking on more junk mail, we may be able to forego a Saturday shut down for delivery. I agree LB! I think they are on to something! Imagine. What a bunch of business consultants can’t pull off, a little stuffed animal does. Ha. Of course! Stuffed animals are adorable! Business consultants are bullies.